Last summer when I was home visiting family in Maine, we noticed a small speck on my 4-year-old niece’s cheek as we were getting ready to eat lobster and corn on the cob. (No, that’s not just a stereotype.) Immediately, everyone went into a drill: carefully remove the tick and put it in a Ziploc bag and then watch very closely to see if a bullseye ring appears—the warning sign of Lyme disease. I remember as a kid occasionally being told to check for ticks, but it was more a concern for our dogs than people. Today, I see frequent warnings about ticks, and hear more stories of my friends (and their children) being diagnosed with Lyme disease. To be sure, there are many factors behind the spread of ticks that carry Lyme disease, but we know that shorter winters and fewer frosts (which kill ticks) make it worse. That’s why I’m excited that a new consortium of medical professionals is speaking out about how climate change is harming our health. The newly launched Medical Society Consortium on Climate & Health represents more than half of the nation’s doctors through 12 of the top medical societies. 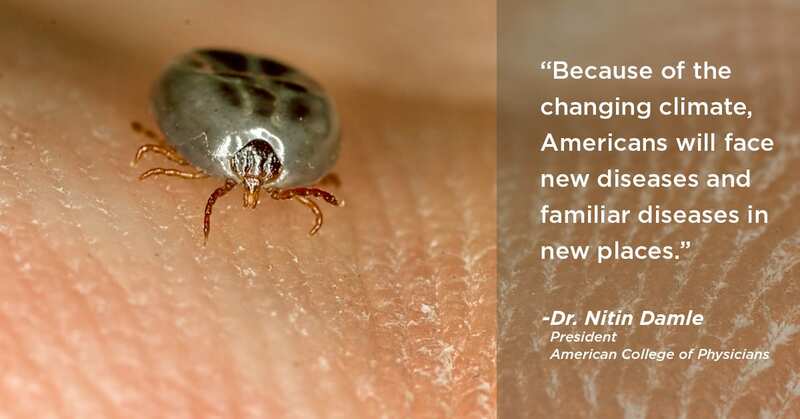 Before working with the consortium, I didn’t fully make the connection between ticks and our changing climate even though I’d seen the impacts firsthand. Polling shows I’m not alone. In fact, three out of four Americans can’t name a single connection between climate change and worsening health, despite decades of robust scientific research that tells us this is true. Heat waves are making football teams practice early in the morning or late in the evening to avoid heat stroke. We’re seeing more and worse asthma attacks and heart disease from poorer air quality—driven by pollen, the particles from increasing wildfires and other climate-related changes. More frequent and intense hurricanes, floods and extreme weather put people at immediate danger and leave lasting mental and physical health impacts. You can learn more about how climate change is harming our health in the consortium’s report, “Medical Alert! Climate Change is Harming Our Health,” and from stories in USA Today, CBS News or Popular Science. 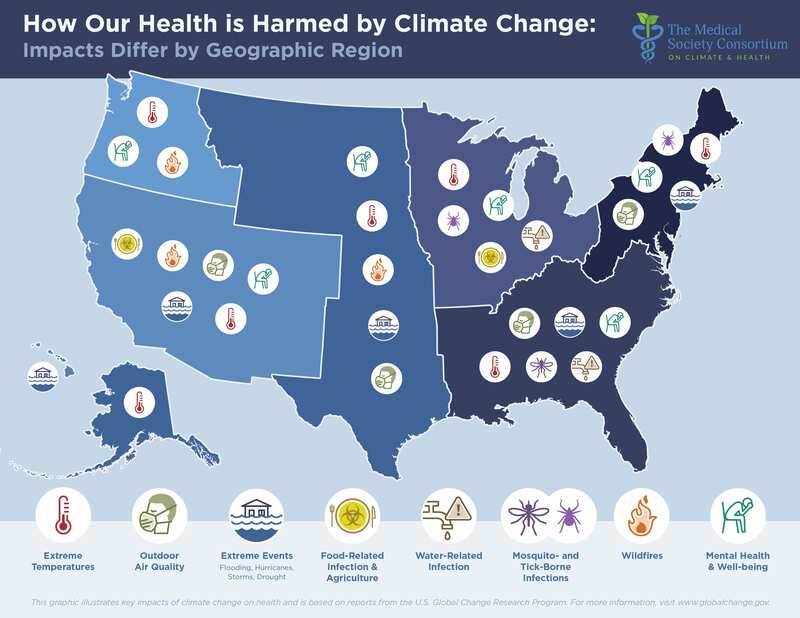 This map we developed shows some of the key ways climate change is harming health in each part of the country. Here’s the good news: while tackling climate change feels like a long-haul effort, we know that this work—and specifically switching from dirty fossil fuels to clean, renewable energy—immediately improves health. The consortium is working to make sure that business leaders of all stripes and policymakers of all parties and at all levels of government know this. Their educational efforts appear to be gaining traction—last week, New Jersey Congressman Frank Pallone mentioned the consortium and its report on the floor of the House of Representatives. I was fortunate to spend my summers exploring the outdoors and my winters sledding in the woods around my house, but I worry about my nieces and nephews. It’s not just because summer is uncomfortably—and even dangerously—hotter, or they can rarely go ice-skating. It’s because their health is at greater risk because of climate change. It gives me hope that their doctors are sounding the alarm and diagnosing this threat.